Replacement for original AN-26-1300 coils used on some devices in early Bally and Bally/Midway solid-state pinball games 1977-1987. Includes coil sleeve and diode across solder lugs. 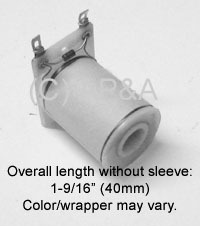 FITMENT NOTE: This is an aftermarket replacement coil that measures 1-9/16 inches overall length (not including sleeve). Original factory coils were 1-1/2 inches in length. If the device you are installing this coil in will not accomodate an additional 1/16 inch length (some will not), then this replacement coil will not fit or work in your game. Please measure before ordering, as coils are electronic parts and not eligible for return.